For over two decades Robert Boudwin was better known as Houston Rockets mascot “Clutch the Bear,” which was a character he created in 1995. In addition to performing at over 1,500 games and 6,000 shows across the world in 12 countries he served as a content creator in the engagement economy helping to build the Rockets brand through in-game experience, grass roots marketing initiatives, community investment projects, creating an on-line presence and social media strategies. He authored 7 children’s books, and was producer of popular school shows reaching over 1.2 million elementary students at over 2,100 shows. Boudwin was a 2006 inductee into the Mascot Hall of Fame in his first year of eligibility, 2 time NBA Mascot of the Year & a Houston Chronicle Hometown Hero in 2014. In the summer of 2016 Robert opened his own Marketing Consulting & Public Speaking Practice with the NCAA, The Harlem Globetrotters, Harris County Houston Sports Authority, University of Houston, Sam Houston Race Park, Houston Racepark, HoustonOnTheCheap.com, Menchies Frozen Yogurt, Clifford Group & Professional Sports Partners being just some of his clients. 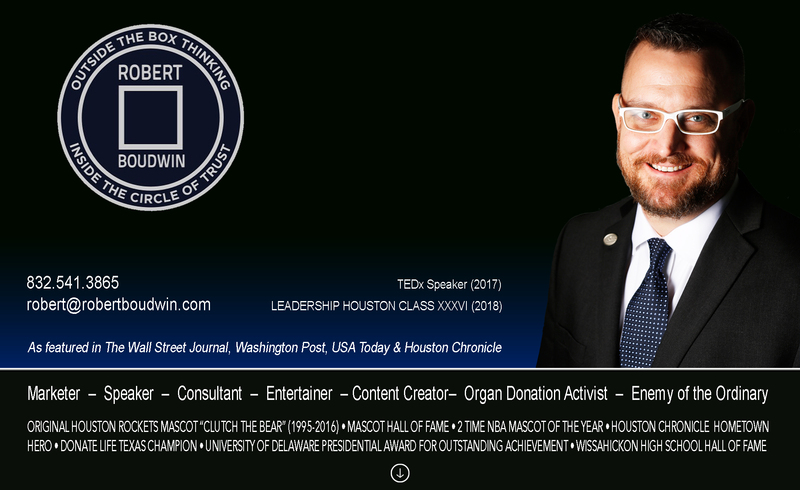 Philanthropically he is best know for his work with organ donation awareness having run the Houston ½ Marathon twice in the full Clutch mascot costume promoting the cause (personally raising & donating over $100K to the cause) and serving on the Corporate Board of Directors for Life Gift since 2014. He is a member of Leadership Houston Class XXXVI graduating in 2018 and in 2017 gave a TEDx Talk in Houston. Although Boudwin graduated from the University of Delaware, his final 21 credits where obtained right here at the University of Houston and transferred back to UD while he was launching the Rockets new mascot CLUTCH. He is a COOG & Blue Hen at heart & proud to join the UH Athletics Team as the Assistant Athletic Director of Marketing & Game Presentation in 2018! He resides in Spring, TX with his 4 children: 2 sets of twins, twin boys Luke & Jack born 2009 & twin girls Brooklyn & Bailey born 2016. CELEBRATE HOUSTON — 1 UH Athlete from each of our 17 intercollegiate sports pair up with a City of Houston Work (police, firefighter, school teacher, road worker or EMS worker) at 17 iconic Houston Locations to CELEBRATE HOUSTON! MEN’S BASKETBALL INTROS — Check out the crystal clear on court projection that turns our court into a high definition movie screen & the BRAND NEW only been done once before by any sports team anywhere…Red COOG Phone Flashlights turning the Fertitta Center RED & answering the question of what happens when ME BECOMES WE with 7,000 UH FANS! GO COOGS!! !